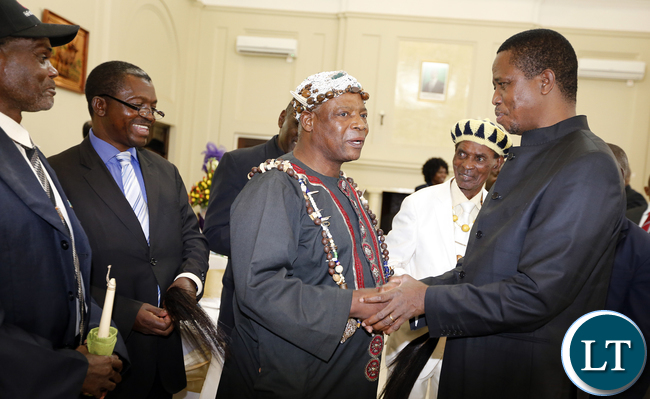 President Edgar Lungu chats with Chief Nkana at State House. 15 Lamba Lima Chiefs held meeting with the Head state,They were lead by Senior Chief Chiwala and Senior Mushili- Picture by Eddie Mwanaleza/State house 24-12-2015. Chief Nkana of the Lamba speaking people of Lufwanayama Town on Copperbelt province has called on government to ensure investors operating in his chiefdom plough back profits to his subjects. Chief Nkana says it is sad that his chiefdom is languishing despite having the biggest emerald mining in the country. “ Why is it that up to now the only road that leads to the emerald mine is still in a deplorable state despite several calls to have it worked on, “ he said. He has therefore said investors should not just use the Zambian land and people but should pay back their dues through various Cooperate Social Responsibility. Speaking when provincial minister Japhen Mwakalombe paid a courtesy call on him at his palace, yesterday, Chief Nkana noted that for this reason he ( Mr Mwakalombe ) should ensure that investors taken it upon themselves to ensure that part of their profits is used on various development projects o task so that the face of the chiefdom can change for the better. And Mr Mwakalombe said government values the role investors play in the country but noted that they should be accountable and take care of the community they are operating in. He pledged to do everything possible to ensure that the investor plough back to the community adding that he will not only pressure the investor to work on the road but also to support the people through the CSR. He said once they work with the community it will also help their business because the people around them will support them. And chief Shimukunami thanked government for various developmental districts that have taken place in his chiefdom. Next articlePart 2: National Dialogue – Compromised Parties and leaders? Ba chief bamu zed ,do you even have Royal trust funds, to develop your own areas? So much resources in your chiefdoms only chief mukuni knows the worth of his land because he hangs out with the best business brains. Forgive my friend Joshua Shamunene aka chief nkana he must have gone there high on shake shake, his favorite brew. Investors in insurance industry are skimming billions out of Zambia and the Pensions and Insurance authority and ZRA is sleeping. Foreign insurance brokers and insurance companies are siphoning of billions by depriving indigenous citizens by scheming up ways to take premiums disguised as reinsurance premiums. Sanlam and Marsh Insurance Brokers are the biggest culprits in facilitating billions of kwacha transfer out of Zambia.No ploughing back. Hakainde Hichilema and Muna Hantumba are fronts of Sanlam Life and Africa Life companies. It is called Lama. It is closer to a Congolese dialect which basically comes as close as you say. There are words there that really do sound close to a Zambian language. It is like KiLuya of Kenya and iciBemba of Zambia. My Royal Highness, this has been going for more than 40 years so what have we been doing? Senegalese small hustlers came, made money and have left. …all this with the help of local people. Women sheltered these aliens as they plundered the emeralds. So what’s the point of coming in as an investor if not to make profits. This thief I mean chief seems to be confused. Actually that is what you do.You use the people, exploit them and take advantage of them for as long as they remain stupid and damn..Open your ba chief.Do something about it at least. He’s actually a mine owner himself.